Rural microgrids can improve local energy resilience and sustainability. One of these such rural microgrids — this time on a Harnett County, N.C., hog farm — was dedicated this past week in celebration of the project’s completion. The cooperative microgrid, which is expected to promote environmental sustainability and support the surrounding community, is the handiwork of the Butler Quality Pork and Renewable Energy Farm, South River Electric Membership Corporation and North Carolina’s Electric Cooperatives. 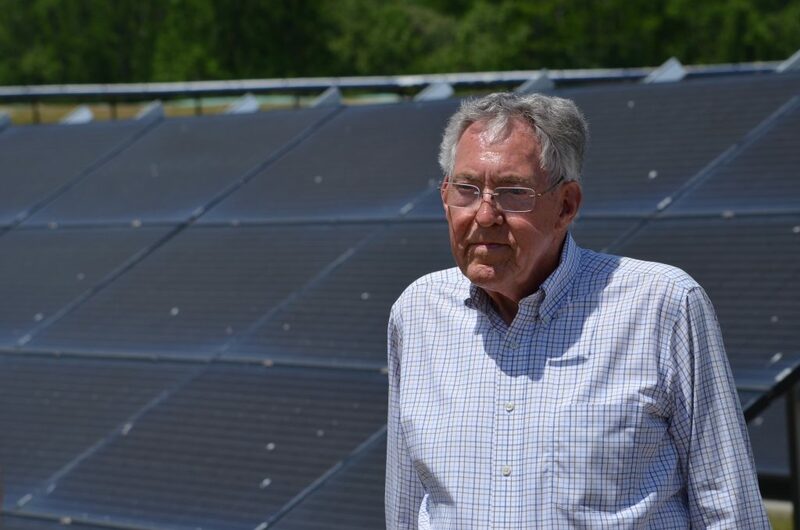 William Butler, owner of Butler Quality Pork and Rewnable Energy Farm, in front of 20-kW solar array that is part of the farm’s microgrid. The Butler Farms microgrid integrates a 20 kW of solar, a 100-kW diesel generator, a 185-kW biogas generator, and a 250 kW/735-kWh battery system. A controller manages all of the components. The project will produce electricity that can be used to power the farm and nearby homes. 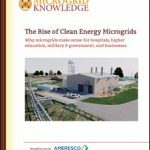 The microgrid is capable of islanding and operating on its own, independent of the grid — a key feature of microgrids when power fails on the main grid. But this project can also remain connected to the main grid and supplement conventional sources of electricity. Project organizers describe the microgrid as unique in that is serves as a case study for how two of the state’s most important industries can work together — agriculture and electric utilities. Butler Farms, in Lillington, N.C., is a member of South River EMC, a local electric cooperative in nearby Dunn that serves more than 43,000 consumer-members in Harnett, Cumberland, Sampson, Johnston and Bladen counties. “South River EMC has a long-standing partnership with Butler Farms, and we have taken great interest in their pursuit of cleaner farming techniques with less negative environmental impacts as well as the implementation of several renewable energy resources,” said Catherine O’Dell, vice president of member services and public relations at South River Electric Membership. According to the press release announcing the launch of the microgrid, this project marks the first time that a member’s existing energy resources have been integrated into a microgrid that was developed by the state’s electric cooperatives. This project is unique in that is serves as a case study for how two of North Carolina’s most important industries can work together — agriculture and electric utilities. And it seems this type of project might be gaining steam in North Carolina. In fact, another cooperative microgrid is also in operation on Ocracoke Island. This microgrid was developed through a partnership between Tideland Electric Membership and North Carolina’s Electric Cooperatives. Track news about cooperative microgrid projects. Follow us on Twitter @MicrogridNews.